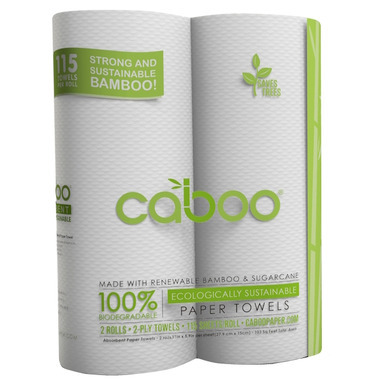 Caboo Bamboo Paper Towels is tree-free paper towel, made from 100% bamboo & sugarcane fibres, and provides a sustainable alternative to conventional paper made from trees. It is biodegradable and whitened with H202, a natural alternative to bleach. Excellent...perfect for cleaning...I love Caboo..
Not sure what I am doing differently, but they are not disintegrating very easily for me and I find that I can reuse them for progressively grubbier jobs before I throw them out. They are my new go-to product for cleaning and spills. I love the bamboo paper towel. I gave it a 4/5 because it breaks apart easily when wet (can't scrub anything clean with it), however I found it was fantastic for my intended purpose. I use the paper towel to make my own bamboo baby wipes. They don't leave peices behind and aren't made with harsh chemicals. I feel good using this product on my baby. Poor quality for the money. They didn't tear easily. Would not buy again. Loved the toilet paper, liked the tissue paper but not liking the paper towels. The paper towels tear easily - too flimsy. Keep trying though - love the idea of a sustainable product. I was so pleased with the Caboo bamboo toilet paper, I decided to try the kitchen paper towel also. I wasn't disappointed! It is soft and absorbent - much better than recycled paper products. Used for picnic duty this past weekend and was pleased with how it held up to liquids. I would buy again to keep my table and my conscious clean.